We have a fantastic cut lined up of those of you that receive regular steaks in your Kettle Club share, grass-fed beef cheeks! Not only are they healthier than many traditional and familiar beef cuts, cheeks pack a ton of flavor! Let’s take a deeper look at what makes this cut so versatile and delicious. Cows love to chew! Unlike other mammals, cows have the unique ability to digest cellulose, or plant fibers such as those found in grass. Structurally, these fibers are super strong, and take a bit of work to unlock their viable nutrients. Cows accomplish this quite well with the use of two important body parts. The rumen, a compartment of their stomach that acts as a fermentation vat to break down strong plant fibers, and their mouths. Ever notice that when you see a cow it’s chewing? Cows chew a bit harder than other animals because food needs to be chewed twice before entering the fermentation vat of the rumen. This helps break down the fiber and unlock nutrients faster. Cows spend nearly eight hours every day chewing their food. This can total upwards of 40,000 jaw movements per day!!! What’s this mean for cheek muscles? They’re super strong! The continuous chewing movement means more blood flow to the area and toned muscles that result in an enormous amount of flavor for the cut! How to I cook them? Unlike other muscles that don’t get as much of a workout like tenderloin and shoulder (chuck), these cuts need proper preparation to break down strong muscle fibers for fall-off-the fork tenderness. We recommended braising, or cooking with a mixture of both quick, high, heat and low, slow heat. Check out this recipe for Braised Beef Cheek Tacos! A fantastically fresh and healthy meal for spring! Our patrons often ask us about the breeds of swine we source for our delicious pork products. The simple answer, heritage breeds. But what are heritage breeds, and why are they important for genetic preservation of the swine species? What is a Heritage Breed? While there is currently no set definition for the phrase, heritage livestock breeds are the breeds that flourished in the agrarian societies of our ancestors. 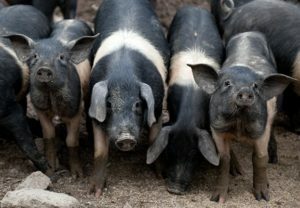 Long before the modernization of agriculture when pigs were raised primarily on pasture, it was important that these animals possessed the necessary skills needed to thrive in specific environmental conditions. Genetically speaking, we refer to these skills as traits, and keeping these traits intact ensured that our forefathers could produce a bountiful supply of meat to feed their communities. Why are Heritage Breeds Important? But modern agriculture has moved away from raising pigs on pasture, and hardiness, sturdiness and adaptability are no longer desirable attributes. Instead, commodity pork producers seek faster-growing animals that reach market weights in record time. The shift in genetic selection has led to an overall decrease in the swine breeds of the past. The United Nations’ Food and Agriculture Organization reports that 20% of the world’s cattle, goats, pigs, horses and poultry are currently at risk of extinction. A consequence of this potential extinction would be the loss of unique traits that could help these animals thrive in any future, harsh conditions. What Kinds of Breeds Do We Source at Kettle Range Meat Company? 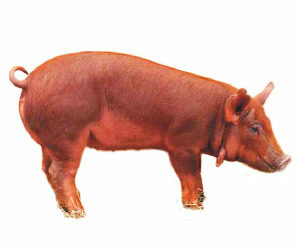 This native Tuscan hog is prized for its delicious, extremely tender, buttery flavor and intense marbling. A favorite of chefs and charcuterie makers, the cinta is extremely rare. As recently as the ’90s, the Cinta was considered to be endangered, but a few dedicated farmers, including our partner Ken Kehrli, are working hard to bring it back. Characterized by a fleshy wattle on either side of their neck, these breeds are best known for their rich textured and delicious hams. 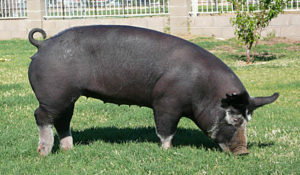 This breed is sometimes referred to as kurobuta, which is Japanese for black pork due to their hair color. They are known for their savory, umami flavor. 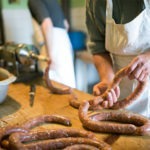 Our butcher staff has created up a special holiday sausage for Kettle Club members this month, Traditional Polish. Our head of production and Master Butcher Joe Parajecki shares his fondest memories of this classic holiday treat. I come from a Polish family deep rooted in tradition—especially when it comes to holiday meals. Fresh Polish sausage, sometimes with sauerkraut, sometimes with fresh grated Horseradish, has always been a staple at our holiday table. I remember fondly my grandmother making sausages on the days that would lead up to Christmas, the smell of garlic and marjoram filling the house. The smell would linger on and we would waiting in full anticipation during on Wigila Dinner Christmas Eve (a tradition including foods that come from the four corners of the earth: forest, sea, field, and orchard) but we would have to wait until after Midnight Mass to enjoy it. Each year I continue this tradition with my family using the time-honored recipe passed down from my grandmother, and I share it this month with you. We’ve prepared fresh polish sausage using my grandma’s recipe for our Kettle Club members this month. I hope you enjoy it as much as I have over the years. In a large bowl, combine one cup of the soy sauce with the sugar, garlic, and scallions, stirring until mixed. Place the pork in the marinade and toss to coat evenly. Marinate for one hour. In a small bowl, combine the brown sugar, honey, and remaining soy sauce, stirring until smooth. Place the pork and chopped vegetables in the slow cooker and spoon the honey glaze over the top of the, making sure to fill the cracks and crevices on top. Cook on low heat for 3-4 hours. Once the pork is cooked through and tender, remove the vegetables and pork from the tray, making sure to save all the juices. Slice the pork into ½-inch slices, and plate with the roasted vegetables. Spoon the reserved pan juices on top of the pork, and enjoy! For those of you who receive regular steaks in your Kettle Club share, we’ve prepared a mouthwatering spin on a timeless dish, London Broil. Despite its name, the dish isn’t English at all. In fact, it originated right here in North America and is said to have popularized in Philadelphia around 1931. 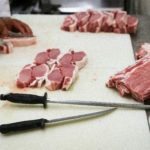 The name actually refers to the method of preparation and not the cut of meat itself. The original method of preparing London Broil used flank steak, pan seared medium rare and cut across the grain to be served. Today’s London Broil is typically marinated and prepared from a variety of cuts including top round, sirloin tip and chuck steak. Your Kettle Club London Broil comes from top round and arrives pre-marinated in Joe’s famous Black Diamond marinade that includes soy sauce, Worcestershire sauce, balsamic vinegar and a variety of other seasonings. To enjoy the traditional dish, preheat the grill or broiler and place the meat on a rack 5 inches from the heat source. Cook for 8-10 minutes on each side to achieve a perfect medium rare temperature. Remove the meat from the heat and place on a cutting board to rest for 2 minutes. Slice the meat thinly remembering to cut against the grain to loosen any tight tendons that might cause the meat to be a bit chewy. Enjoy! As Wisconsin as cheese curds and beer, Door County cherry picking is a time-honored tradition. And Kettle Range is excited to incorporate these delectable gems of the peninsula in this month’s Kettle Club shares. Our butchers have prepared a seasonal bratwurst with tart cherries straight from Wisconsin’s cherry mecca. The history of cherries in Door County runs deep. The first European settlers to the peninsula could rely on vegetable crops for sustenance farming but due to the rocky terrain of the landscape, found it challenging to yield anything more than what they needed to get by. The search began for a cash crop that would flourish in the rocky soils of Door County. In the late 1860’s, a Swiss immigrant named Joseph Zettel arrived on the scene discovering that fruits like apple trees prospered in the area because the shallow soils left only a few feet from the roots to the bedrock. This provided adequate drainage for such fruits that are prone to root rot, a devastating plant disease. The success of the apple trees attracted two University of Wisconsin horticulturists who began experimenting with other fruits such as plums, strawberries, raspberries and the most famous, cherries, which proved especially efficient at growing in Door County. Door County cherry production continued to prosper and hit its peak in the 1950s with 700 cherry producers growing nearly 50 million pounds of cherries annually. Today, the Montmorency cherries that grow in Wisconsin account for 90% of all the tart cherries grown statewide. Like Door County cherry picking season, these brats have a small window of availability. Don’t miss out on these seasonal Wisconsin delicacies in August! Joe the butcher has created a unique twist on a Chicago delicacy for our Kettle Club members this month. June’s Italian beef sausage has been prepared with mozzarella, fresh basil, oregano, and hot giardiniera. It makes a great sandwich right off the grill, or incorporate the flavor kick to your favorite pasta or pizza recipe. Before you begin enjoying June’s distinctively delicious sausage, let’s talk a little about giardiniera. First off, let’s all say it together, “JAR-DIN-AIR-AH.” There, that’s better. Originating in Italy, the word giardiniera translates loosely to “female gardener” or “one who pickles vegetables.” And why not with all its fresh ingredients? Recipes differ, but most variations of the condiment include hot or mild peppers, celery, carrots, cauliflower and olives. Italians used the method of pickling to preserve vegetables for the winter. It is thought that giardiniera was introduced to the United States in Chicago during the late 19th century following a wave of Italian immigration. The fiery condiment quickly became synonymous with Chicago’s famous Italian beef sandwiches and made its way into the hearts and refrigerators of area residents. For years, Chicago chefs and foodies have been perfecting their recipes and pickling techniques to bring giardiniera lovers a more heated version of the Italian original. So, let’s tip our hats to our neighbors to the south and enjoy some great sausages this month! Let’s all enjoy the heritage pork breeds featured at Kettle Range this month and cook up a summer favorite, pulled pork! Check out this recipe that includes our own Chef Jeff’s famous BBQ rub. Add salt to cold water, and stir very well until all the salt is completely dissolved. Then add the brown sugar, dry rub, and bay leaves, and stir well to combine. Rinse the pork shoulder, and place in a large container. Pour in the brine solution until the shoulder is completely covered. Cover the container, and place in the refrigerator for at least 8 hours. Remove pork shoulder from brine solution, and pat dry with paper towels. Place the pork shoulder in a baking pan that is at least 3 inches deep and that is bigger than the shoulder by at least an inch in length and width. Sprinkle dry rub onto the surface of the shoulder and massage in such that it adheres to the surface. Coat all sides. Make sure the fat layer on the shoulder is facing up before cooking! Place baking pan uncovered in a 225° F oven on the middle rack. Insert a probe thermometer into the center or thickest part of the shoulder, but not touching the bone. Monitor the temperature throughout cooking (a digital thermometer with an alarm function is the easiest way to do this). Do not remove from the oven until the center of the shoulder reaches 200°. When the shoulder has reached 200°, shut off the oven and let the roast cool for a couple of hours before removing from the oven. If the bottom of the pan is dry (or crusted with dried spices) then cover the pan with foil to retain internal moisture of the meat during the cooling period. When the temperature drops to 170 degrees or slightly lower, remove from oven. Place on a large, clean work surface such as a cutting board, and remove the large sheet of crusted fat on the top. Pull apart with two forks, it will pull apart very easily. Serve for friends and family! Please welcome your new Kettle Club Coordinator, Nikki Barr. A Missouri native, Nikki grew up on a diversified farm where she took a special interest in raising and showing heritage swine breeds. By age ten, she had raised her first grand-prize-winning Hampshire! She continued to foster her passion for agriculture by attending the University of Missouri where she earned a degree in animal science. Nikki joins us after holding several positions related to pork production, including reproductive specialist and producer communications coordinator in the veterinary medical field. Please reach out to Nikki at any time with questions or inquiries regarding your Kettle Club subscriptions. You can also chat with Nikki at the Kenosha Harbor Market where she’ll be tending to the Kettle Range booth every Saturday morning. 5 Roast recipes we are craving this month. Tired of traditional pot roasts? Looking to keep your creative juices flowing in the kitchen? Check out these five recipes we are craving this month. This simple recipe blends a variety of flavors of winter ready staples. Blending the savory juices of the braised pork along with the sweet cider and parsnips, this recipe is bound to impress the entire family. For full recipe click HERE. Kick Taco Tuesday up a notch with House Of Yumm’s Mexican Brisket. This blend of pablano chile, garlic, onion and spices will inspire a variety of meals. Use this recipe to have a build your own nacho night or a round of flavorful street tacos. Discover the full recipe HERE and getting planning your next Taco night now! Change up your chili with this Paleo inspired recipe. Swap out your typical ground beef and enjoy this chili featuring tender chuck roast. This recipe from Nom-Nom Paleo is sure to fill you and keep you steady on your New Year resolution. Click HERE for the full recipe and instuctions. Spice things up with a little Cuban flare! A unique blend of citrus and herbs will have you dreaming of summer, while keeping you warm and full. Hop over the Noshtastic’s blog and get this recipe HERE. I hope these recipes help inspire you. May they keep your warm and toasty all month long!